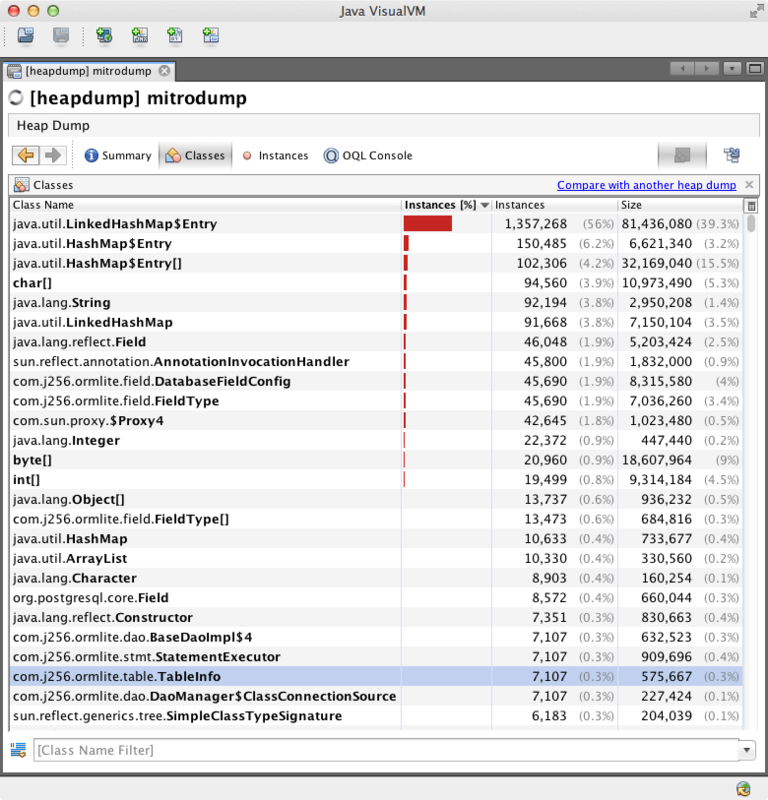 Last week, I tracked down a Java memory leak for the first time in years. I had to re-learn how to do it, so this is a note to my future self (and hopefully others). In this case, I found it using the JDK's debugging tools. While I know people who rave about some of the commercial tools, or Eclipse's Memory Analyzer (MAT), I've never tried them. The leaks I've dealt with have been obvious enough that the built-in tools got the job done. 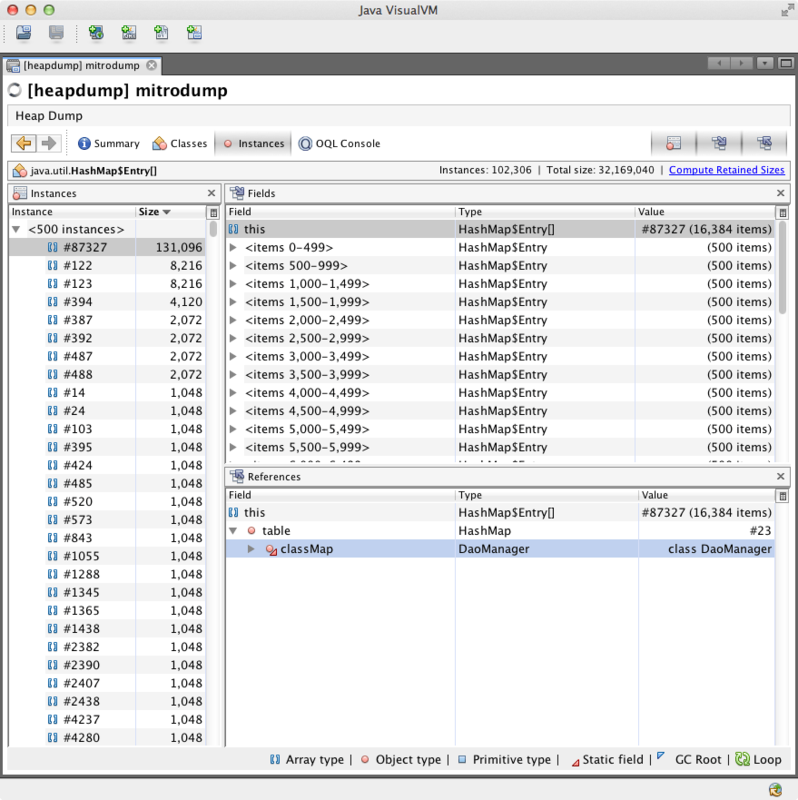 In fact, I find the JDK's tools (particularly jstack, jmap and hprof) to be useful enough that I know make sure all my production machines have the JDK installed, not just the JRE. The left hand pane shows all instances, with largest first. The top entry (selected) is an array of 131 096 elements! The top right pane shows the object's fields, with this (the object itself) selected. The bottom right pane shows all references to the array. This shows that it is referred to by a field called HashMap.table, which is part of the HashMap object containing the array. In turn, this is referred to by a static field DaoManager.classMap (part of OrmLite). This is the smoking gun: looking at the source of DaoManager quickly showed that this static field is a cache. In our case, it holds references to a huge number of database connection objects. Despite closing the connections, these objects were not removed from the cache. Adding a call to DaoManager.unregisterDao solved the problem. I would argue that OrmLite's default caching behaviour is very stupid, and this cache should at least use weak references, allowing the objects to eventually be garbage collected. On the other hand, we aren't really using OrmLite te the way it was designed to be used. This is a debate for another post, since our quick-and-dirty fix solved our problem.